"Bowl 6"" X 6"" w/ round corners"
"Bowl w/ two handles 5.5"" dia"
These small handpainted bowls are great for serving food or condiments which require bowls this size. They are also great for food preparation bowls. Lead-free and dishwasher safe. This handpainted bowl is multi purpose. Excellent for salads and pastas! High-fired and lead-free. These small handpainted bowls are great for serving food or condiments which require bowls this size. They are also great for food preparation bowls. Lead-free and dishwasher safe. "Bowl w/ two handles 7""dia"
"Oval tray w/ handles 6.5"" X 11"""
"Bowl 8.25""dia X 4"" high"
These handpainted bowls are great for salad and food service. They are lead-free and dishwasher safe. Perfect tray for dips and sauces. This hand painted bowl is multi purpose. Excellent for salads and pastas. High fired and lead free. "Bowl 11.5"" DIA X 3"" H"
"Bowl 9.75"" dia X 4.50"" high"
"Fruit bowl 13.5"" dia X 7.5"" high"
This hand painted bowl is multi purpose. Excellent for salads and pastas. This hand painted bowl is multi purpose. Excellent for salads and pastas! High fired and lead free. This fruit bowl is a great addition to any kitchen. 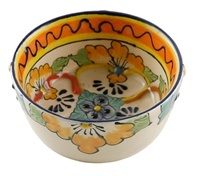 "Bowl 12"" dia X 5"" high"
This hand painted bowl is multi purpose. Excellent for salads and pastas. High fired and lead free. © Copyright 20165 Tierra Fina. All Rights Reserved.